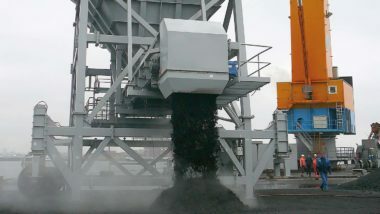 HH200 Loading Hopper is rubber wheel mounted and standardized for receiving material from a grab crane at ports and stock yards. 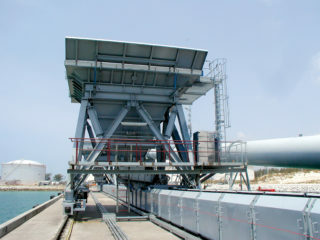 HH200 Loading Hopper can be fed with grab craneor vessel ́s own discharge boom. Loading Hopper is equipped with a belt feeder that discharges the material onto a fixed port conveyor or to a HC200 Link Conveyor. 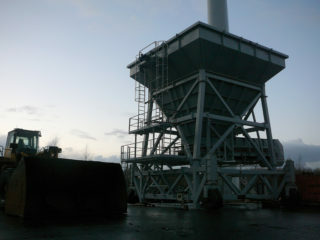 Loading Hopper can be easily relocated to another position. The Hopper is equipped with hydraulically liftable rubber wheels and can be towed to another location. 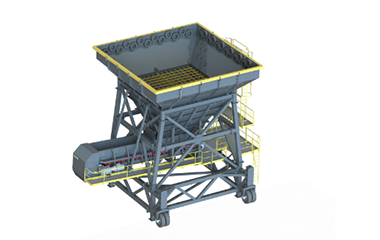 Loading Hopper can be optionally delivered with Plug&Play Electrification. In the standard electrical cabinet a frequency converter allows soft starting and belt speed adjustment. It can also be connected to a communication bus to allow remote condition monitoring and control. Standard delivery includes belt misalignment switches on both sides of the feeder. Available options are rotation detector and lockable main switch with the Plug&Play Electrification.